Discussion in 'Mac Pro' started by Asgorath, Sep 13, 2012. There has been a fair amount of confusion about the NVIDIA PC card support since it was last enabled in the 10.7.3 web driver. I'm going to use the term PC card to describe a stock card with no EFI, that is, any old NVIDIA graphics card that you can buy online or from your local computer store. 1) What OS versions will work? That is, all versions from 10.7.5 and beyond (including 10.8. *, 10.9. *, 10.10. * and 10.11. *) will work with most pre-Maxwell NVIDIA PC cards out-of-the-box. Note that the Fermi generation cards work with Lion, but in almost all cases the Kepler cards require Mountain Lion. You may find a GK107-based card that boots in 10.7.5, but it is highly recommended that you use Mountain Lion since there appears to be much better driver support in that OS in general. To be clear, the stock Apple drivers now contain basic support for many NVIDIA cards, in particular those from the Fermi and Kepler families. This means that you might not have to swap out the card when doing a Software Update to the next OS version. In all cases, it is recommended that you update to the corresponding NVIDIA web driver, as those drivers tend to have more bug fixes and/or performance improvements than the stock Apple drivers. Update: This information pre-dates the release of Maxwell, and does not apply to later Kepler or Maxwell GPUs. 2) A new OS update from Apple just came out. What do I do? As mentioned above, all stock OS drivers from Apple will now make stock NVIDIA PC cards work. If you have installed a web driver from NVIDIA, it is likely that the OS update from Apple will overwrite them. Now that the stock drivers from Apple will still let your card function, this is not a deal breaker. Update: This no longer applies, since the web drivers are separate binaries now. The web drivers will stop working when you update to a new OS version, as they are locked to a specific OS release (e.g. 15B42). You should NOT attempt to make drivers from one OS release work with a new OS release in general, since the drivers are closely tied to the frameworks that shipped with the version of the OS that the driver was intended for. Trying to force the 10.8.1 web driver to work with 10.8.2, for example, is just asking for trouble and will probably make your machine no longer boot to the desktop. Update to the new OS, live with the stock drivers for a few days. Wait until the new driver is released by NVIDIA, then update to the new OS. I usually do the latter, since that allows me to get all the benefits of the web driver in the mean time. 3) Where do I get the latest NVIDIA drivers? Some people have complained about not being able to find the latest NVIDIA driver for a given OS release, so I'll just list them here for reference. These can be found by searching for Quadro 4000 or GeForce GTX 680 drivers on NVIDIA's site, you won't find anything if you search for a GTX 570 or GTX 980 for example since those cards are not officially supported. If you are using a PC card, it is recommended that you always run the latest driver from NVIDIA's site, even if the base OS version allows your card to work out of the box. SnowLeopard will never, ever work with PC cards. Period. If you've been holding off updating, perhaps the fact that Mountain Lion works with PC cards will be enough to convince you to update. No matter what, updating to the latest OS is the only way to get driver updates, and if you care about GPU performance then this alone should be enough motivation to stay current. Apple only supports the latest major OS version. 5) What GPUs will work? As far as we can tell, basically any card will work, especially with Mountain Lion. The Lion driver appears to work well with the Fermi generation, but the Kepler generation cards only work with Mountain Lion and beyond. Note that while cards like the GTX 480 and GTX 580 technically work, they have a TDP of 245-250W which is above what the Mac Pro can officially support (225W). If you want to use these cards, you'll probably have to drive them with an external power supply. In general, a card like the GTX 570 would be a better choice, since it has a TDP of 219W. The rule of thumb is this: if the card has one or more 8-pin power connectors, it might draw too much power and you should check to see what its TDP is. It is generally safer to stick with cards that have one or two 6-pin power connectors. Note that many GTX 680 cards do have both a 6-pin and 8-pin power connectors, though their TDP is down in the 190W range and should work fine. Here's a rough list of when new cards started working. Note that these Maxwell GPUs will not work with the stock Apple drivers, so you must install the NVIDIA web driver first. 6) What GPU should I buy? Update: This information is pretty out of date at this point, and I'm not really going to keep it up to date. It's clear that NVIDIA has good support for all their products, so I don't think I need to tell you what card to buy. It basically boils down to budget and TDP, i.e. just buy the biggest GPU that you can afford that works with your power supply (225W by default in the Mac Pro). This is a great question, and depends on your budget and what you'll be using the card for. If you care more about gaming and have an unlimited budget, get a GTX 780 Ti. If you care more about compute (CUDA/OpenCL) and have an unlimited budget, get a GTX TITAN Black or a GTX 570. If you can only afford a mid-rage card, get a GTX 760. If can only afford a low-end card, get a GTX 650. In general, if you are buying a card now, I would recommend getting a Kepler card and using Mountain Lion. If you really care more about OpenCL or CUDA performance, then the GTX 570 or TITAN Black is probably the best choice. Brand of card does not matter, though I personally stick with EVGA in general. If you are stuck with a MacPro1,1 or MacPro2,1 then your options are slightly different, since the Kepler cards don't work in Lion. If you have an unlimited budget, get a GTX 570. Otherwise, get a GTX 560 or GTX 560 Ti. I think it's unlikely that the Kepler cards will ever be supported on Lion, which does limit the options for older Mac Pro systems. 7) Are these cards officially supported? No, the PC cards are not officially supported, but they do seem to work very well with the most recent drivers. 8) Will the boot screen work? No, the boot screen requires that the card has an EFI on it, so the screen will stay black until the login window or desktop starts up. This is probably the scariest part of the installation process, since you don't know if the card is working until the system has finished booting. 9) I use Boot Camp a lot. How do I switch OSes without a boot screen? Many people switch into Boot Camp by holding down the Option key while the system starts. Given that this is part of the boot screen and thus does not work with a PC card (i.e. the screen stays black), you will need to use an alternative method of selecting which OS to use. You can manually select the boot partition by using the Startup Disk pane in System Preferences under Mac OS X. You can also select "Restart in Mac OS X" using the Boot Camp system tray icon under Windows. You can also just use a third-party app like BootChamp as well. 10) How do I install a PC card? Installing the card is easy. First, you should ensure that you are running a supported OS and/or driver. If you are running on an OS that does not natively support the PC cards, like 10.7.4, you must install the NVIDIA driver before you install the card. You should install the driver and then reboot to make sure it is working correctly. Once you have an OS/driver combination that supports the PC cards, simply shut your machine down and plug the card in. You should make sure that you connect power cables to all the plugs on the card. 11) I don't have enough power cables. Where do I get more? The Mac Pro has a special low-profile connector on the motherboard, so you need a cable like this or this. Make sure the cable you get specifically says it is for the Mac Pro, there are many different choices and not all cables will work. 12) What slot should I install the card in? Many people have reported issues with the PC cards not working well in PCIe slot 1, that is, the slot closest to the CPUs. There's an image on AnandTech that shows the slot numbers, for reference. As such, you should probably install the card in the other 16-lane slot. For the 2009 and newer models, that means slot 2. NOTE: MacVidCards has narrowed this down to only the MacPro3,1 (2008) model, for more information check his post here. Yes, CUDA should just work. You should update to the latest CUDA driver, of course. 14) Why doesn't my Adobe app detect a CUDA device? You need to add your card to the list of supported devices. This list is a simple text file. FIXME: Need to provide more details here. In general yes, but you might have to jump through a few hoops in some cases. In general, the drivers now have good support for OpenCL for both Fermi and Kepler generation cards. The only major issue right now is the 2GB RAM limitation, which I'll cover next. 16) My GPU has more than 2GB of RAM and OpenCL isn't working. What do I do? Update: As of 10.8.3, this workaround is no longer needed and you should not attempt to modify the framework binaries. Kudos goes to Netkas and MacVidCards for this, but there is a solution to this particular problem. Be warned: several people have not followed the instructions correctly and caused their system to stop booting. MacVidCards wrote up detailed instructions in this post and this post of this thread. The fix involves modifying the Apple OpenCL framework binary to remove the check for more than 2GB of RAM. Make a backup copy of the OpenCL framework, and leave it unmodified. This will let you boot up in Safe Mode by holding the Shift key and restoring the original file back to /System/Library/Frameworks in case something goes wrong. Check the exact size of the OpenCL framework binary before and after the edits. It should be the same in both cases. If the edited file is larger, that means you inserted the bits instead of replacing them, and this will not work. It might be nice to get MD5 sums of the original and working edited binaries, so folks can check their work as well. 17) Are the PC cards forced to only use PCIe 1.0? The PC cards used to be forced to only use PCIe 1.0 (2.5GT/s), but the most recent drivers from NVIDIA for Mountain Lion (304.00.00f20 for 10.8.1, 304.00.05f02 for 10.8.2) appears to remove this restriction under Mac OS X. The PC cards will still run at PCIe 1.0 speeds under Boot Camp, however. Note that this only affects the MacPro4,1 and MacPro5,1 models, earlier systems will still only run at PCIe 1.0 speeds. My guess is that the PCIe bus speed is negotiated by the EFI, and defaults to PCIe 1.0 when there is no EFI on the card. The latest NVIDIA driver for OS X appears to work around this somehow, but the same fix hasn't been (and probably won't be) applied to the Windows drivers. 18) Where has the PC card support been discussed in the past? BREAK THROUGH THE GLOOM !! !Kepler comes to Mac Pro...GTX680 !!! 19) I have my new card installed and working, but Cinebench didn't get any faster. What's going on? Cinebench R11.5 is an old benchmark that is not very efficient. As a result, the application cannot feed enough work to the GPU to keep the GPU busy, and as such you'll see the same FPS score with an 8800 GT as you will with a GTX 680. This is what I would consider a "CPU limited" benchmark, as opposed to a "GPU limited" one like Unigine Heaven. If you want to test your new card, I would highly recommend a newer benchmark like Unigine Heaven or LuxMark, since those actually stress the GPU enough for it to matter. On top of that, Cinebench R11.5 is old enough that it no longer reflects CINEMA 4D performance like it was designed to do. CINEMA 4D is now up to R14 from what I can tell. 20) There is corruption in the lower left or upper right corner of the screen. Is my card damaged? on certain cards like the GTX 570/580 and GTX 670/680. This was fixed in the 10.8.1 web driver, as far as we can tell, so you should make sure you are running the latest version of Mountain Lion with the NVIDIA driver. There is currently no fix for this in Lion. 21) Why is the GTX 570 better than the GTX 680 for CUDA and OpenCL? Many people get confused by the different core counts for the Fermi and Kepler generation cards. The architetural differences are discussed in detail in the AnandTech review of the GTX 680, and it's worth reading the whole article if you'd like to understand the differences. 22) My card has one or more 8-pin power connectors. Will it work? There have been many lengthy discussions about just how much power the Mac Pro can deliver to a graphics card. 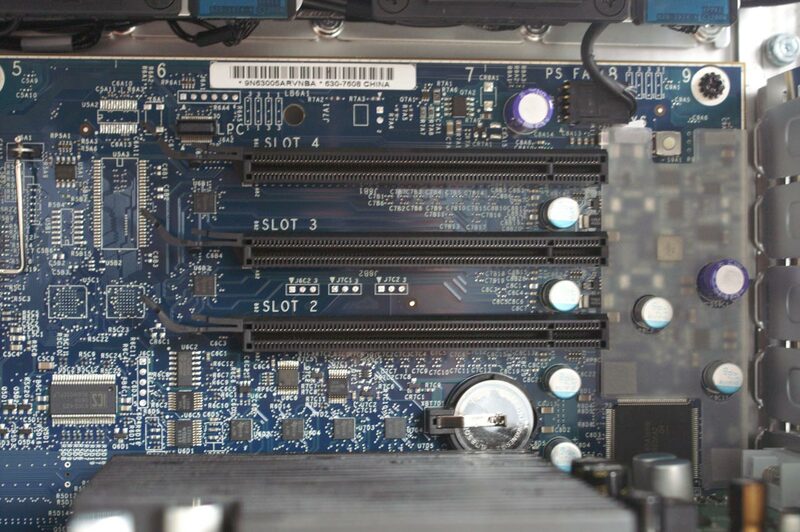 The generally accepted consensus is that the two 6-pin connectors provide up to 225W (75W from the PCIe slot, 75W per 6-pin cable). Since 8-pin cables are specified to deliver 150W, the safest way to power a card that has one or more 8-pin connectors is to use an external power supply. Someone posted guides about how to rig both an internal and external power supply, need to find the links. I ended up buying the FSP BoosterX 5 to power my GeForce GTX TITAN card, and have had very little trouble with it. It has enough power (450W) to drive two cards with 8-pin connectors. To be clear, it's quite possible that using a 6-pin to 8-pin converter cable is safe and won't damage your system in any way. If you feel comfortable running like this, then feel free to to do. However, since nobody knows the exact tolerances of the power traces on the motherboard, specifically those connecting to the 6-pin plugs on the motherboard, we generally advise people to either use a card that has 6-pin connectors, or use a second power supply. 23) The installer complains that I don't have the correct OS version, but my version number appears to match. What's up? The NVIDIA web driver is tied to a specific build of the OS. Sometimes, Apple releases multiple versions of the same OS, for example 10.9.2 was 13C64 with a security update to 13C1021. If you try to install an NVIDIA driver for the wrong build of 10.9.2, it won't work. You can check the build of the OS by selecting "About This Mac" from the Apple menu in the top left of your screen, then clicking on the text that says "Version 10.X.X". For example, I'm currently running 10.9.3 and when I click that text, it changes to "Build 13D65". An example of where this won't work is if you tried to install 331.01.01f04 on 10.9.2 (13C64), or 331.01.01f01/f02 on 10.9.2 (13C1021). All drivers are for version 10.9.2 of the OS, but since there are separate builds, not all driver releases will work with every possible build. If the installer won't run due to a version mismatch, it's best to check the list earlier in this post to make sure you have the correct version for the particular OS build that you are running. 24) I have a newer card that isn't supported by the Apple drivers, how do I install the web drivers that enable it if I can't even boot? This is a common problem for people who buy bleeding-edge cards, but there's a pretty simple solution. The NVIDIA drivers, both the one from Apple and the web driver, will not load if you have nv_disable=1 in your boot args. That will let you boot to an unaccelerated desktop, at which point you should be able to install the web drivers for your current OS. You should then remove the nv_disable flag from your boot args and reboot, and you should be up and running. Obviously if you have other settings in your boot args string, you should add them at each step as well. This is particularly important for people with Maxwell based cards like the GTX 750 or GTX 9xx series, as the stock Apple drivers currently do not support the Maxwell architecture and will cause a kernel panic if they are enabled. This has been described as a "reboot loop", where the system will continually reboot after hitting the kernel panic during startup. If you are using a Mac Pro with one of these cards, you will still need an EFI card to drive a monitor so that you can update to the new web driver. This card (e.g. a GT 120) will be running in unaccelerated mode so everything will be slow, but the EFI on that card will allow the Mac Pro to light up the display connected to it. An alternative is to connect from another system via VNC or Screen Sharing, as this will work even when the NVIDIA drivers are disabled. People using Hackintoshes don't have to worry about using a second card as the Hackintosh boot loader will initialize the card using the VBIOS and thus the monitor will light up, but you will still need to run with nv_disable=1 in order to avoid the kernel panic until you have updated to the NVIDIA web driver for the new OS version. 25) I get an error message "This computer is not compatible with the NVIDIA Web Driver". How do I install the web driver? Update: This hardware check has been removed as of 346.02.02f02 for 10.10.4 (14E46), so the driver should now just install on any system. Leaving this information in case people need to modify older drivers for some reason. By default, the NVIDIA web driver checks to see if you are running on a MacPro3,1 through MacPro5,1 or have an NVIDIA PCIe GPU installed (via the "NVDA,noEFI" property in the IORegistry). Older Mac Pros or other systems will fail this check and the installer will not work. Turns out it's actually quite easy to remove the hardware check. Simply open up a Terminal window, and run the following commands, assuming the web driver package is in your ~/Downloads folder. Note that my example uses the 343.01.01f03 driver, you should substitute the exact version you are using. This will repack the contents into the installer package. Simply double-click the installer and it should run on your system. 26) Will Pascal GPUs like the GTX 1080 work? No. We expected they might have been enabled with the first release of the 10.12 drivers, but as each Software Update from Apple comes and goes, it seems less and less likely that Pascal GPUs will ever be enabled under macOS. At this stage, I would not recommend buying a Pascal GPU with the intent of using it under macOS until NVIDIA releases a driver that enables it. Update: NVIDIA has announced that web drivers that enable Pascal are coming soon. 27) Why does every security update break the NVIDIA web driver? Tie each driver release to a specific build of the OS, so that they can guarantee that those binary interfaces remain static and thus their binary drivers are compatible. Every time Apple releases a new build of the OS, NVIDIA must release a new build of the drivers to match. Assume that Apple won't change these binary interfaces in a security update and allow one driver build to work with any version of a specific OS release (like 10.12.2). If Apple does change one of these interfaces, the driver would continually crash or cause kernel panics, thus rendering the system basically unusable. NVIDIA has chosen the first of these two options in order to avoid the huge support burden that would be generated any time Apple changes an interface that their drivers depend on. Having the desktop continually crash or the system go into a kernel panic boot loop can be very difficult to recover from, so NVIDIA has chosen the lesser of two evils and will generally require a new driver build to exactly match the specific OS build that Apple releases to the public. 28) Should I buy an NVIDIA GPU? Short answer: No. The lack of official eGPU support, and the lack of a web driver for Mojave, suggests the relationship between NVIDIA and Apple is not in a good place. As a result, it's probably best to stick with a modern AMD GPU like the RX 580 from the official eGPU enclosures. I think everyone agrees that we'd like to see some timely releases of high-quality drivers that enable all NVIDIA GPU architectures like Volta and Turing before anyone would recommend using NVIDIA on macOS. dabotsonline, h9826790, aaronraimist and 8 others like this. Asgorath, the GT520 works as well. It's what i'm using at the moment as a stop gap. Updated, thanks. I've also successfully used a GTX 560 Ti, GTX 580 and GTX 680. Fixing OpenCl just screwed my system. I feel like a total douchebag. Yeah, you should always save a copy of the OpenCL framework binary before editing it, and if you screw something up you can just swap back in a card with an EFI and restore the file from single-user mode. I'll be going into detail about this when I update the OpenCL sections later. Perhaps add a section answering the question: Is the 570 or 670 the best for me? Possible answer: 670 and 680 will provide better gaming performance than 570, but 570 might provide better performance i pro apps since it isn't limited like the 6xx in CUDA utilization. It's not just you. Same thing happened to me and at least a few others. There have been improvements in various posts on how to do it in terms of step by step clarity, but they're still not complete. And...if you have a card with more than 2 GB VRAM, it is even more complicated. Note that OpenCL should work without modification with the 304.00.00f20 driver, right? The only modification that is needed with 10.8.1 is for cards with more than 2GB of RAM as far as I know, you shouldn't need to change anything to enable OpenCL acceleration by default (if you have a card with up to 2GB of RAM that is). Anyway, I need to go through all the threads here and on netkas.org to figure out what the state of OpenCL is. Will update the OP once I'm done with that. I thought I read somewhere that PS and Illustrator make use of OpenCL, whereas on the other hand, AE and PP use CUDA. Don't quote me on that and I'll let others more informed chime in. Photoshop CS6 does not use CUDA and apparently only uses OpenCL for a very limited number of features. Just FYI I have both a GT 440 and a GTS 450 in my Mac Pro (all running off of the DVI ports) with no issues. I installed the driver, shut down my Mac Pro, dropped the GT 440 in and it worked just as expected (I later added the GTS 450 with no issues either). FIXME: Need to figure out what slot this is for the 2006, 2007 and 2008 models. Nice work getting this all together. 2. Installed Nvidia's Quadro 4000 driver. The GTX470 and GTX480 worked well but there were many complaints of "Fermi Freeze" with GTS450 and GTX460 in 10.6.8. The support for these PC BIOS cards provided by Nvidia appears to use the same mechanism first employed by Netkas, right down to giving the same "Error gathering information on PCI cards" when one attempts to use the System Profiler "PCI Cards" section to see if the cards are running at 1.0 or 2.0. I have found that there are combos of cards installed where this section actually functions, though I have never narrowed down how that works. I'm guessing that Asgorath may have an idea? Question to be added to the FAQ - What about cards with more than 2Gb memory? FIXME : question 13 - Is PCIe 2.0 enabled in Windows with these cards? The 2GB limit only applies to OpenCl and then only to 10.8 I think. The PCIE thing in WIndows is unaffected by OSX drivers. It is POSSIBLE that Nvidia Mac driver division could get the Windows department to add the functionality, but VERY doubtful. EFI cards have PCIE 2.0 in WIndows. Yeah, this is all true, but given how bad the 10.6.8 drivers were for the Fermi cards, I'm trying to steer people away from going that route. Sticking with Lion/Mountain Lion at least gives you an up-to-date driver that has good support for those families of GPUs. I'll add a note to the FAQ explaining this in my next round of edits. Good job, I hope this gets pinned/stickied! The 2006/2007 1,1 and 2,1 Mac Pro machines have assignable PCI lane bandwidth, but only the bottom (slot 1) is 16x. They are all only PCI-e 1.0 as well. I think I read somewhere there are problems with the modern 5xx and 6xx cards in these older machines? But without an EFI BIOS, will Steam games work in OS X? Yes, that's what I meant by "work" The cards are fully accelerated and generally very stable, particularly with Mountain Lion and the f20 driver. All the Steam games will run just fine, and will usually destroy the official EFI cards in terms of overall performance. Thanks for confirming... Any issues with cards with more than 2GB of RAM? I've heard that if you leave an EFI card in the MP, and then add in a PC card, you'll still get a EFI boot screen. This true? Also, what will happen in windows (Bootcamp) if it sees 2 different video cards? (Like for instance, I have a GT120, and might add a 560Ti). Edit: Good work on this info BTW!